It seems like the questions around histamine intolerance are coming in more often than ever before. So I wanted to spend the time researching and addressing any and all histamine intolerance information for you today. Histamine (2-[4-imidazolyl]ethylamine) was discovered in 1910 by Dale and Laidlaw, and it was identified as a mediator of anaphylactic reactions in 1932. All of the below (unless otherwise noted/sourced) is taken from the Chris Kresser ADAPT Academy Program I am part of. 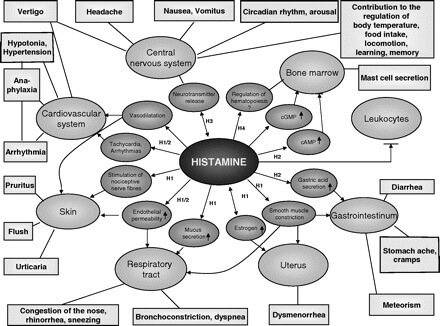 Histamine is a natural chemical in our bodies that acts as a neurotransmitter; is involved in muscle contraction, brain function, and the regulation of stomach acid; and plays an important role in the immune system. Histamine levels in the blood from 0.3 to 1.0 nanograms per milliliter are considered to be normal, and everyone has a threshold of histamine that they can tolerate without symptoms. 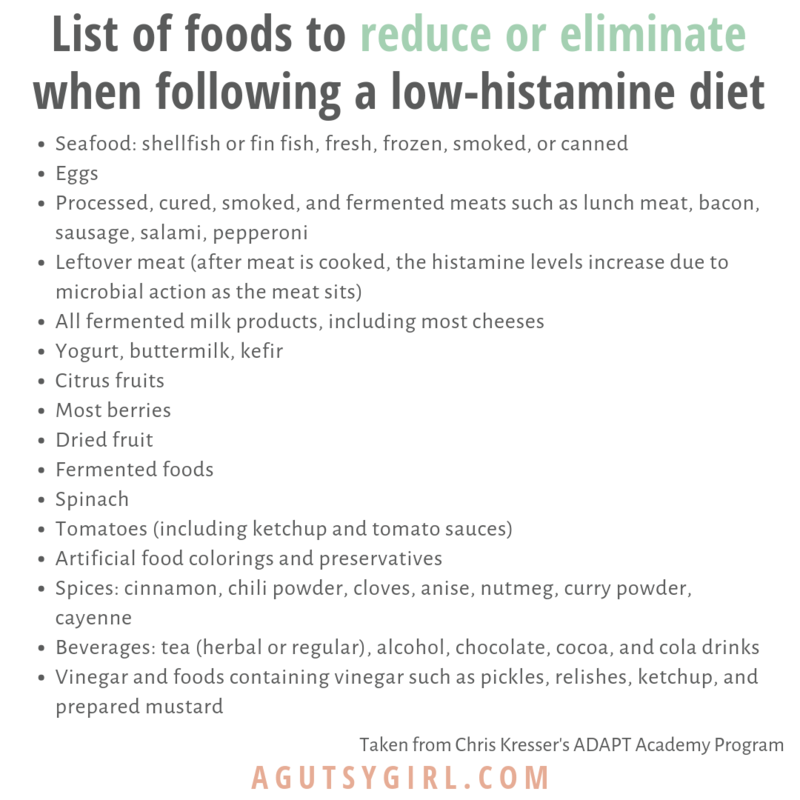 What Does a Histamine Intolerance Look Like? 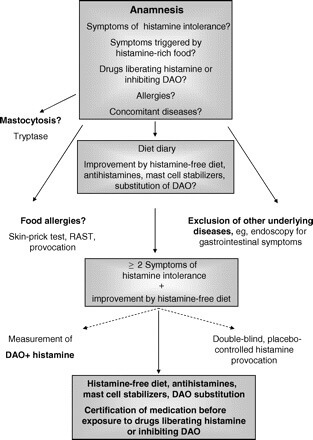 Note: Recent research suggests that what many patients and clinicians have referred to as histamine intolerance may be better characterized as mast cell activation syndrome (MCAS), a condition involving hyperactivity of the mast cells that produce histamine. The etiology and pathology of MCAS are still poorly understood, and it is likely a heterogenous disorder with causes and expressions that vary among individuals. Dr. Amy Myers lists the following as causes of low DAO. I share these because, just look – it’s all tied to the gut. 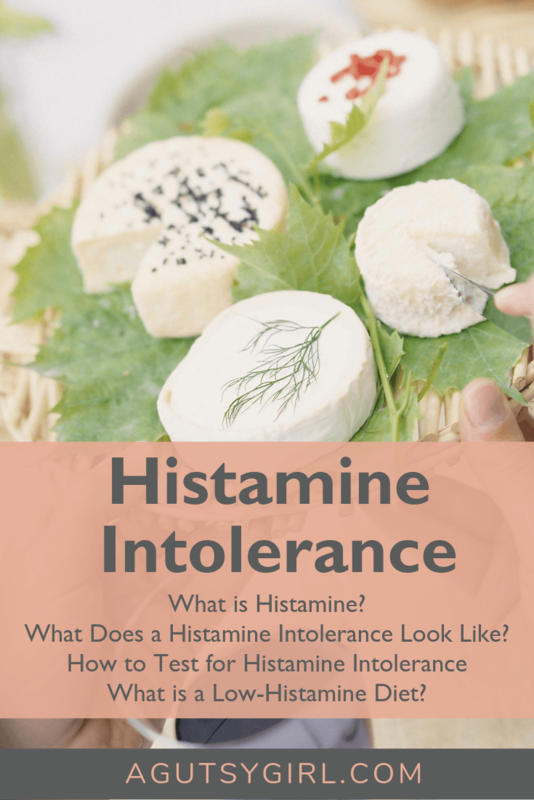 Histamine intolerance is unlike other food allergies or sensitivities in that the response is cumulative, not immediate. The example Chris Kresser gives is this: Imagine it like a cup of water. When the cup is very full (high amounts of histamine in the diet), even a drop of additional water will cause the cup to overflow (symptoms activated). But when the cup is less full, it would take more water (histamine) to cause a response. This makes histamine intolerance tricky to recognize. Furthermore, there aren’t any reliable lab tests for accurately diagnosing MCAS or histamine intolerance because many people with MCAS have normal serum histamine and DAO levels. So what is done to diagnose it? 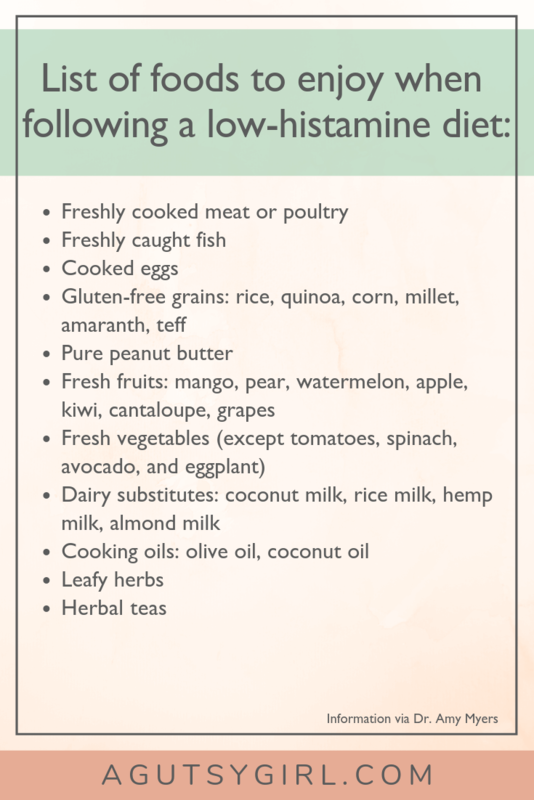 If you have a skin condition, consider that histamine intolerance might be the underlying cause—especially if you have one or more of the allergy-related symptoms mentioned above. 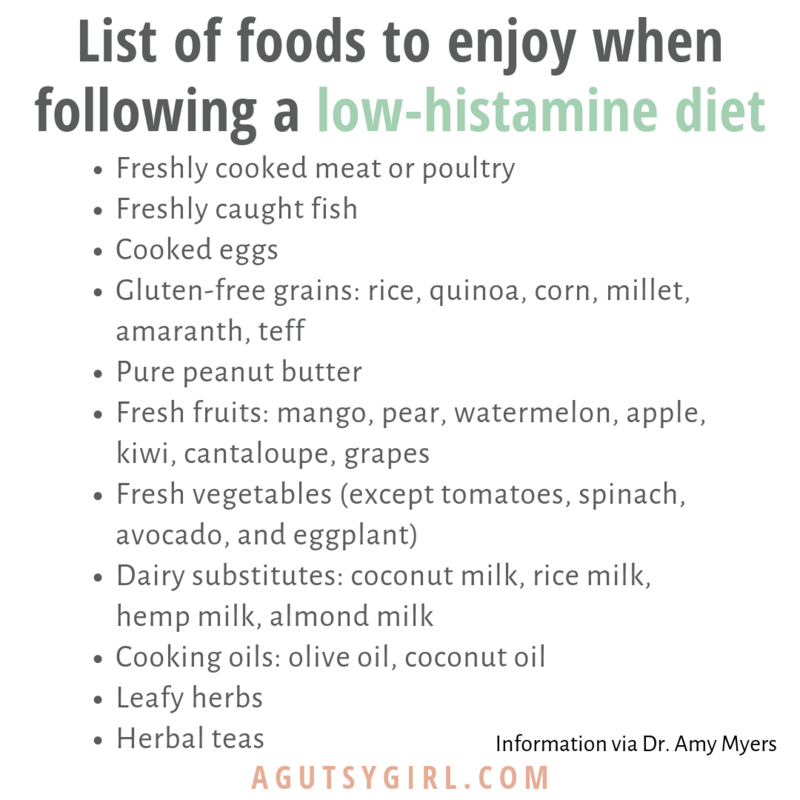 In these cases, a low-histamine diet can be started to bring histamine levels down and hopefully clear up his or her skin. 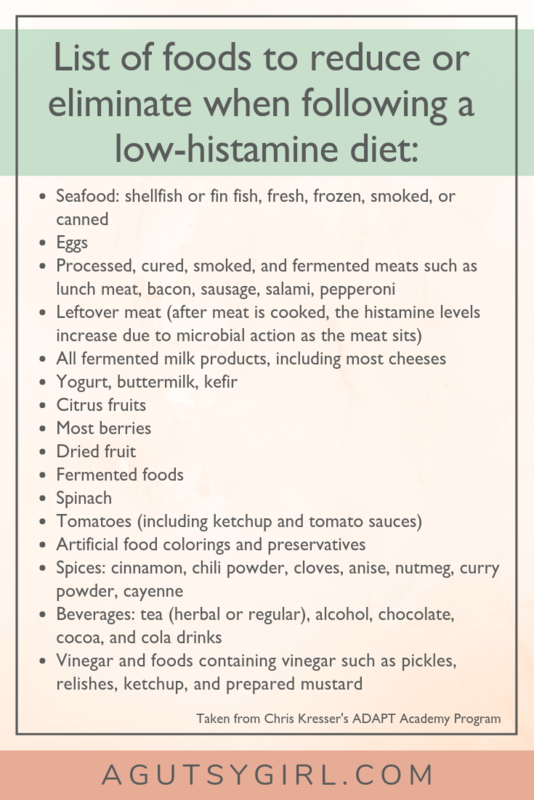 What is a Low-Histamine Diet? Note: Many probiotics contain histamines, which is why that specific probiotic might not work for you (as a reader commented below). The probiotic I recommend for those with SIBO/histamine intolerance is the Just Thrive one. Learn all about Probiotic Species and Strains HERE. First and foremost, freshness is key if you have a histamine intolerance. Beyond that, here are some specific foods you can still enjoy. And guess what? Most people can tolerate histamine foods again once they heal the gut. Ding. Ding. Dr. Amy Myers says her histamine intolerance was caused by SIBO. Getting to the root of anything and everything sets you free. I’ve had bad allergies all of my life, though they’ve certainly gotten better as I started to eat healither. However, I recently started a probiotic and my allergies went crazy (possibly the worst I’ve ever had). After some research I learned that some strains produce histamine inside the body. My symptoms subsided once I stopped taking that probiotic and now I’m going to be looking for one that doesn’t contain L. buchneri, L. helveticus, L. hilgardii or S. thermophilus (source: https://www.healthline.com/nutrition/probiotics-side-effects#section3). Just thought I would share in case others have had similar issues!